Haven’t decided on a hotel yet? 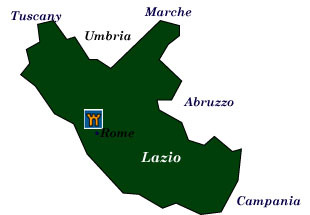 You can look at other available hotels in Rome or the region of Lazio with Booking.com. If you are interested in staying in a villa in Lazio, Booking.com offers a number of stunning properties. Dominated by the immense sprawl of Rome, the region of Lazio offers its own ancient ruins, museums, and villas. Most sights can be visited as day trips out of Rome (you’ll welcome the fresh air after breathing Rome’s car exhaust for any length of time). If you’re renting a car in Rome (driving in the city is for the truly insane) spend a few days exploring the rolling countryside to help adjust to driving in Italy. Lazio has always been a playground for Romans. Lakes to the north of the capital help make a cooling retreat from the heat of the city, and beaches in the far south are reasonably clean. Hill towns and castles, although not as numerous as Tuscany’s, are just as interesting and fun. Rome Among the world’s great capital cities, Rome gloriously displays its 2700 years of history at every turn. Don’t expect to see everything, but don’t miss: the Vatican with its phenomenal museums, St. Peter’s Basilica and the Sistine Chapel; Rome’s ancient heart: the Forum; the Pantheon, and the Colosseum. Since this website is devoted to castles, the Castel Sant’Angelo near the Vatican City is a must. Built as a tomb for Emperor Hadrian, it was fortified in the Middle Ages and used as a papal residence. Linked by a subterranean passageway to the Vatican, popes would flee to the castle to escape during times of danger. Below the castle are dungeons that once imprisoned Benvenuto Cellini and Cesare Borgia. Ostia Antica Once the port of ancient Rome, its ruins provide insight into the lifestyles of the merchant class—in contrast to patrician Pompeii. Tivoli’s villas: Hadrian’s Villa (Villa Adriana) was Emperor Hadrian’s summer residence. One of the largest and most luxurious villas of the Roman Empire, it was inspired by the architectural wonders Hadrian had seen on his travels. Theaters, baths, fountains, and temples abound. The Villa d’Este was a pleasure palace built by Cardinal Ippolito d’Este in the 16th century. It is known for its magnificent gardens and some 80 intriguing fountains. Etruscan sites: Cerveteri (Caere) was an important commercial center from the 7th to the 5th century BC. The main attraction is the necropolis (Necropoli di Banditaccia) with its Etruscan tombs in the form of earth mounds laid out in a town plan of streets and squares. Like Cerveteri, Tarquinia has 6000 painted Etruscan tombs in its necropolis. Viterbo Founded by the Etruscans, Viterbo is one of Lazio’s best-preserved medieval towns. A one-time papal residence, grand palaces and medieval churches are enclosed by ancient walls. Off the tourist route, it’s easy to spend a pleasant day here.